I was very close to biting off my fingernails as I followed the men’s javelin final. Going into the Trials, Sean Furey (Dartmouth ’04) was one of three American who had hit the Olympic standard of 83 meters. 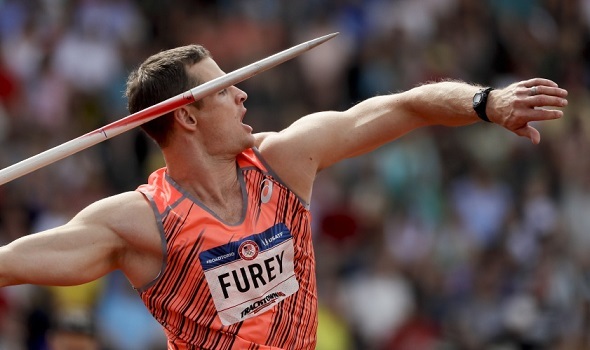 Since the top three men at the Trials who have the standard make Team USA, Furey had a good chance to make his second Olympic Team provided that he made the finals. Well, Furey made the finals with Cornell’s Rob Robbins. But that is when the drama began. On his first throw of the competition, Mississippi State’s Curtis Thompson threw 82.88m (271-11), suggesting that a later throw could surpass the Olympic standard. Furey would only manage a best throw of 69.45m (227-10) that placed him 11th overall – missing out the opportunity to get additional throws. Robbins made the eight-person cut for additional throws as his 73.42m (240-10) throw put him in sixth. Robbins would not better his mark in the finals and ultimately finished in sixth place. One man DID best the Olympic standard – Cyrus Hostetler with 83.24m (273-01) – but Hostetler already had the standard going into the Trials. Hostetler ended up winning the event, and Furey will join him and Sam Crouser (4th in the Trials) as the American contingent for Rio. Furey made the Olympic team back in 2012 in similar conditions as he was one of the few people in the field who had met the Olympic standards and he had finished outside of the top 3. Letsrun.com caught up with Furey after his event, where Furey commented how the moment felt bittersweet as he was happy to go to the Olympics for a second time but was not happy with his performance and would have been ok if someone who had finished ahead of him had also gotten the Olympic standard. Imani Oliver (Princeton ’15) had some good drama in the triple jump qualification. Oliver started off the competition with a new lifetime all-conditions best distance of 13.93m (45-08 1/2) that was wind-aided. She got a wind-legal best of 13.85m (45-05 1/4) on her second jump that had her sixth in the compeitition. But her final jump was a monster as she got a wind-legal distance of 14.02m (46-0), one of three athletes to pass 14m in the competition. That distance is 2 inches away from the all-time Heps record. While she easily makes it to the finals later this week, she will need to get a Olympic Games qualifying mark of 14.15m (46-05) if she wants to go to Rio – a distance only one American has met this year so far. Back on the track, Ben True (Dartmouth ’08) made his 5,000m preliminary race as drama-free as possible. True looked more like his typical racing self as the race progressed, as he situated himself among the front of the pack from the start, allowing other to control the race pace. But the pace was not particularly fast as the whole field was still in a tight pack with a mile to go as they were on track for a 14 minute finishing time. On the bell lap, True was in second place behind Ryan Hill when Portland’s William Kincaid made his move past True to the front. True picked up the pace enough to make sure no one else passed him and True finished third in his heat )13:48.11) to advance to the finals as Kincaid won the heat and Hill finished as the runner-up. This entry was posted on Monday, July 4th, 2016 at 7:57 pm. It is filed under Olympics, Spotlight. You can follow any responses to this entry through the RSS 2.0 feed.